My back has much improved since the weekend thankfully. Which was just as well as Conrad was over earlier this week. We both have a great love of the era of Bismark's Wars so as I'd just completed the basing of three battalions of Austro-Hungarian infantry and two regiments of pro-Austrian German cavalry the choice of game was a no brainer. The three battalions had been painted up as a Hungarian regiment; nice. Better still, in a way, were the two cavalry regiments. North Star 1866 had a 50% sale some months ago so I bought loads of their mounted Prussian officers in feldmutz, enough for three regiments of cavalry in field caps, often worn instead of helmets in this war, especially by some of the German states allied to Austria. I'd already done one as a regiment of Hesse Darmstadt cavalry but what to do with the others? As I am drawn to the campaign in Western Germany in 1866 one was painted up as a Baden dragoon regiment. 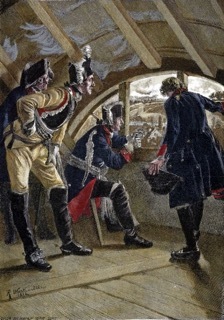 I don't have any Baden troops yet but as the Federal VIII Corps was a right old hotch-potch that isn't a problem. The other I decided would be the 2nd Duke of Cambridge's Own Hanoverian Dragoons. OK, they should have surrendered at Langensaltza with the rest of the army but they could have made a break for it....... Whatever! So, the scenario had the Austro-Saxon army holding a Bohemian river crossing in the face of a Prussian attack. The forces involved were actually quite even, well, ok, they were at first glance but a quick dig down below the surface reveals vastly superior Austrian artillery and cavalry against superior Prussian command, control, morale and above all the dreaded Needle Gun. As always we used Black Powder, with the appropriate special rules to reflect the quality or lack of it, of the troops. *3 were classed as 'unreliable' as they were raised from Northern Italy and therefore not terribly enthusiastic. The Prussians had to secure the river crossings and drive the Austrians off the field or destroy them on it. The river was crossable in one 'move' so there was very little reduction in movement. However, once troops emerged from the river they were deemed to be disordered. Apart from the main bridge, the Prussians could use the railway bridge and could also try and repair the broken bridge on their right flank. Obviously the Austrian objective was to prevent the Prussians from establishing a tenable foothold on their side of the river. The Prussians moved first and their advance guard appeared on their left flank. They made slow progress and were held up by the appearance of 3 battalions of Austrians and some jager who occupied the village by the bridge. (Above and below: The Austrian army waiting for the Prussians, two brigades of infantry above and a reserve cavalry brigade of Cuirassiers and Uhlans below). In the centre the Austrians and Saxons moved closer to the river, as did the cavalry brigade on their far left flank. The main Prussian body then arrived, with one brigade deploying in the centre and the other on the left in support of the faltering advance guard. Both brigades of Prussian cavalry appeared on the right flank, but apart from deploying their artillery and examining the damaged bridge they held their ground for the time being and had to endure pot shots from the Austrian artillery that caused some casualties to their artillery and forced the cuirassiers back from the river. On the left the Prussians launched an assault across the bridge, despite the fact that the river was crossable (I had forgotten actually!). They barely made it to the other end of the bridge before they were hit hard by massed Austrian and Saxon artillery that sent them reeling back from where they'd come from. 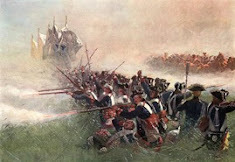 The entire Prussian left flank then piled across the river in assault columns and in a very fierce series of fire-fights and melees managed to drive off the three Austrian battalions holding the hills as well as the Baden dragoon regiment which had attempted a charge on the shaken and damp Prussian jager battalion. (Above, two newly finished regiments of cavalry. They had no right to be in this theatre of the war as they were part of the Austrian and Federal German forces in the west but what else to do? Baden Dragoons in the front supported by the Hanoverian Cambridge Dragoons). In the centre, the Prussian reserve artillery finally made it onto the table and immediately began bombarding the Austrians across the river. Sadly they were soon hit hard by the better Austrian artillery and two batteries forced to retire. Nevertheless, the entire Prussian centre formed up and crossed the river in the face of some stiff Austrian and Saxon opposition. (Above, a general view of the battlefield before both sides got to grips in the centre and below the Baden Dragoons halted and forced back by the fire of the Prussian Jager who had used the railway bridge to help them cross the river). 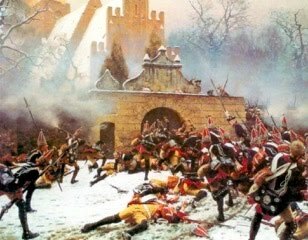 The Austrians charged the Prussians as they emerged from the river in disorder but only managed to force one battalion back. The rest held on and drove off the Austrian assault columns. This was the potential battle-winning moment for the Austrians. Had they been more successful in their attack a massive gap would have appeared in the Prussian centre which their cavalry and the Saxons in reserve were ready to exploit. As it was the assaulting brigade of Austrians were driven off shaken and had to withdraw. (Above, the Austrian assault columns attempt to push the Prussians back across the river in the face of close-range Needle gun fire. One units almost succeeded but was left isolated and forced to withdraw. Below, Prussian cavalry cross the river and crash into the Saxon Reiters). On the Prussian right I threw my cavalry across the river to prevent the Austrian and Saxon horse from attacking my withdrawing infantry's exposed flank. Despite the fact that my troops were disordered after crossing the river one Dragoon regiment charged the Saxon Reiter but were thrown back in the melee along with all their supports. The Saxons followed up and hit the Dragoons again but being now unsupported came off the worst and had to retire. (Above and below, the Prussian left flank are safely across the river after driving off their Austrian opponents, except for the Jager in the village who kept up a harassing fire and repulsed every attempt to dislodge them). 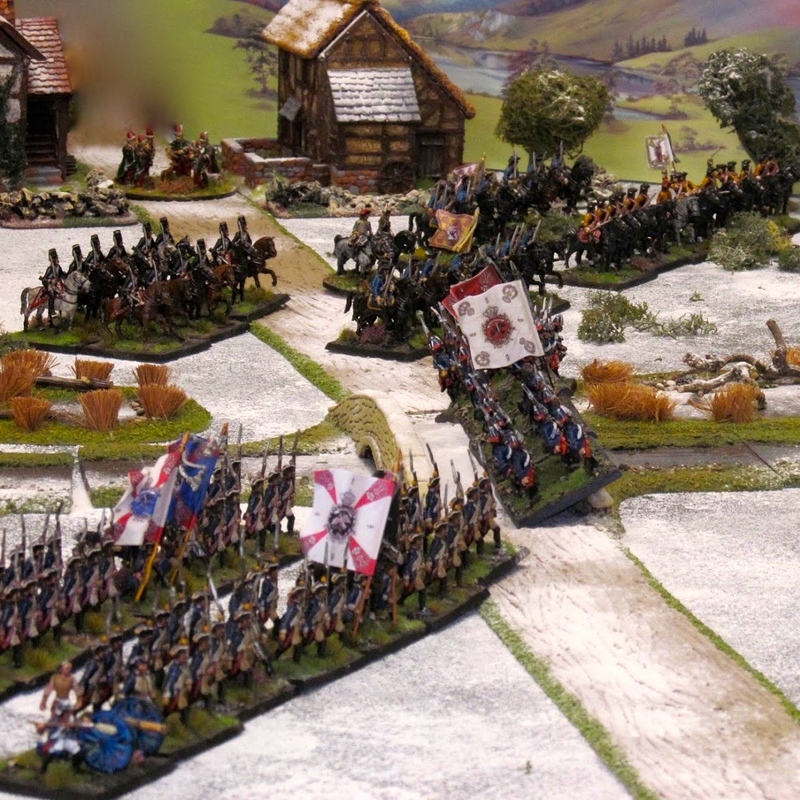 (Below, the Hanoverian Cambridge Dragoons cover the withdrawal of the Austrians brigade forced back by the Prussian attack across the river at the railway bridge). The Austrian right flank with withdrawing shaken and their central brigade was also shaken and unable to take any more offensive action. Only the Saxons and both cavalry brigades remained as viable units so with the Prussians firmly across the river in overwhelming strength Conrad conceded defeat. We agreed however that the Saxons and the cavalry would be able to cover the withdrawal of the remainder of their army effectively. 'Casualties' in Black Powder terms are always hard to determine other than in the number of broken and shaken units; only one Austrian battalion had actually been broken and removed from play compared to no Prussians. 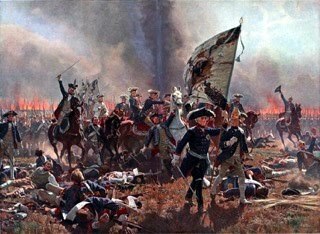 Several Prussian units were shaken but spread across the whole army this had no immediate effect. The Austrians had I must admit very nearly pulled off a victory with their massed assault in the centre but it didn't quite go to plan. 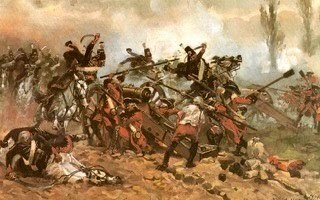 Their artillery had however dominated the battlefield at longer ranges while the Prussian Needle Gun had done the same at close range, so it all seemed about right. Fine looking game. Enjoyed perusing that after lunch. Great post Colin. I have big collections of Prussians, Austrians and Italians - 1866 is one of my favourite periods, but it doesn't get much press. Thanks! And it's less than 2 years to the 150th anniversary of Konigratz so I'd better get painting! Now there is food for thought. I hadn't thought about a significant anniversary. I think some planning will be in order.